ORLANDO, Fla. (CNS) — United by the words of the prophet of social justice, Catholic Church leaders urged black Catholics to become active, just disciples of Christ. 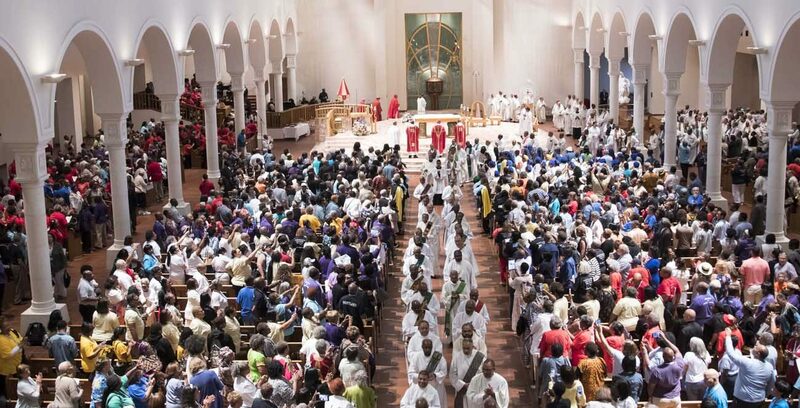 More than 2,000 converged on Orlando July 6-9 for the 12th National Black Catholic Congress where speakers — clergy, lay and religious — addressed a variety of topics and concerns facing black communities and families, while urging those present to take an active, enthusiastic role in living out the Gospel as just disciples of Christ. During his homily at the opening Mass at the Basilica of the National Shrine of Mary, Queen of the Universe, Father Patrick Smith, pastor of St. Augustine Parish in Washington, spoke about the “ridiculous power of the Christ on the cross” and how our own suffering can be offered up to God as a source of healing for others. It is important the community does talk about its struggles, the priest said, but it also must talk about the redemptive power of God on the cross. He added while “racism ultimately leads to death … a spiritual suicide in our souls,” the truths of the Gospel sets lives free. The roots of the Black Catholic Congress stem from 1889 with layman and journalist Daniel Rudd, who brought together 100 black Catholic men to exchange and discuss questions affecting their race for not just Catholic blacks, but blacks across the country, and unite for a course of action while standing behind the Catholic Church and its values. The group met with President Grover Cleveland during its first congress. In meeting and uniting, Father Smith said the Catholic Church demonstrated and voiced how “black Catholic lives mattered,” just as other groups have done as they convened when a group has suffered, such as with the pro-life groups who proclaim unborn lives matter. “Black Catholics are born from the same womb of the baptismal font,” Father Smith said, adding that those gathered for the congress did not convene to achieve higher status, but rather to insist on “inclusion” because black Catholics are equal members of the body of Christ. To demonstrate the power of being a disciple of Christ, Cardinal Turkson spoke about the story from Exodus of the Israelites following Moses in the desert. He asked those gathered to envision facing the Red Sea with the waters of parted and a path sandwiched between two walls of water. The cardinal joked “water is never concrete” and some might have questioned what would happen if there was a really big wind. But the example of the Israelites who choose to follow Moses and trust God to hold up the walls of water demonstrates the courage and attitude that modern-day Christians must hold to be baptized in Christ and become just disciples of Christ. Justice, reconciliation and peace are tantamount to unite the church family of God. While Cardinal Turkson said challenges such as tribalism in Africa and racism and discrimination in America present struggles, the Catholic Church family is invited to live beyond divisions and live in communion as children of God. I listened in each workshop, while I learned something new for me to think about . I’m back home and planning to from what I learned from other attendees, because I know that we all feel the same way and our prayers will be going up together. God bless the Congress committee, and will be for ever grateful that I was able to attend, enjoy the Conference and back with plans in action.